Eli Manning and the NY Giants are now 1-2 after picking up their first win in Houston. Manning put together his best performance showcasing there’s still enough in the tank to get things done. Like any Quarterback, with the right play calls, the right protection and execution you can win. 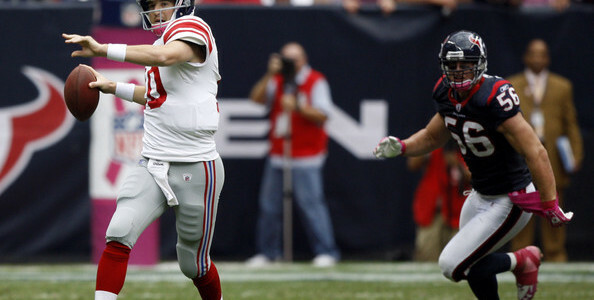 The Texans remain winless, and Big Blue heads into a difficult stretch. Over the next month, the NFL schedule has the GMen facing 4 straight playoff teams from a year ago. They start with the high scoring Saints at the MetLife on Sunday, followed by Panthers in Carolina, the defending Super Bowl Champion Philadelphia Eagles at MetLife before a trip to Atlanta to face the Falcons. Eli will need to play like he did Sunday to come out 2-2 over the next 4 games. The Good: Eli was almost perfect completing 86% of his passes (25-29) for over 10 yards per completion and 297 passing yards/2 TDs. How good was hey? Manning had a 132.3 QB rating. From Spiro Kasabian’s (@NYSPAWTSGUY_SPI) Film Room Breakdown of the line last week it was evident that none of the 5 linemen played well in Dallas, so to see the much-improved production is evidence that Eli and Shurmur are putting in the work. This week, two new players started on the Offensive Line. John Greco at Center and Chad Wheeler at Right Tackle. Both players made a difference and gave Manning some time in the pocket. Although he was sacked 4 times, it was a huge improvement all the way around. A handful of times Manning rolled outside the pockets and delivered a perfect strike to the Tight End or the Wide Receiver. These plays not only work, but Eli Manning gets little credit for running them flawlessly. Despite JJ Watt…being well…JJ Watt, Eli looked comfortable and in command. His four first-half drives all ended in points. Then with the game on the line, Eli went 6-6 on the game-clinching series in the fourth quarter. He was in complete control on the 3rd and 1 with Saquon Barkley out wide in a spread formation. With an empty backfield, he picked his matchup and hit Barkley for a clutch first down. Odell Beckham between 2 defenders in a cover 2 defense during the first half. That throw alone showed Eli has the arm talent to place the ball in the tightest of windows. The Bad: Another delay of game penalty. I’m not sure why this continues to plague him throughout his career. The Ugly: The only “Ugly” was allowing JJ Watt to get momentum (3 sacks). At times he was jumping Eli’s cadence…for the love of all that is sacred, change the snap count. With his teams back against the wall, in a must win, Eli played a near perfect game and came through. For at least one week, the haters will have to hold off.